This super cuddly blue frost fox blanket with black, sheared Kolinsky backing brings a touch of luxury to your home. 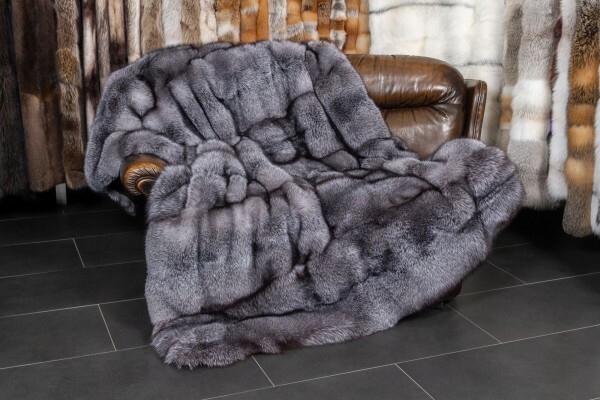 On the one side, this real fur blanket has the high-quality blue frost foxes, and on the other, our master furriers used sheared black kolinsky fur. The Russian kolinsky is first-class wild furs from Russia. Due to the shearing process, the kolinsky fur is extraordinarily warm and soft. By using only genuine fur skins, all our products are naturally heat-regulating. Enjoy pleasant hours at your home with this blue frost fox blanket and enjoy the perfect warmth regulation on cold days. If you have questions or individual requests, you can contact us anytime! Ссылки на другие веб-сайты "Blue Frost Fox Blanket with black, sheared Kolinsky Backing"
Оценки покупателей по "Blue Frost Fox Blanket with black, sheared Kolinsky Backing"